Looking for a central chrono seconds hand from a vintage Okeah (they do exist on other 3133's also and these would be fine). Also looking for seconds hands 3 red and 2 silver for hand wind komandirskie. I'm looking for a bezel to suit a Komandirskie Mini/Cadet. The numbered, red triangle type would be perfect, but I'd be happy with any other type. 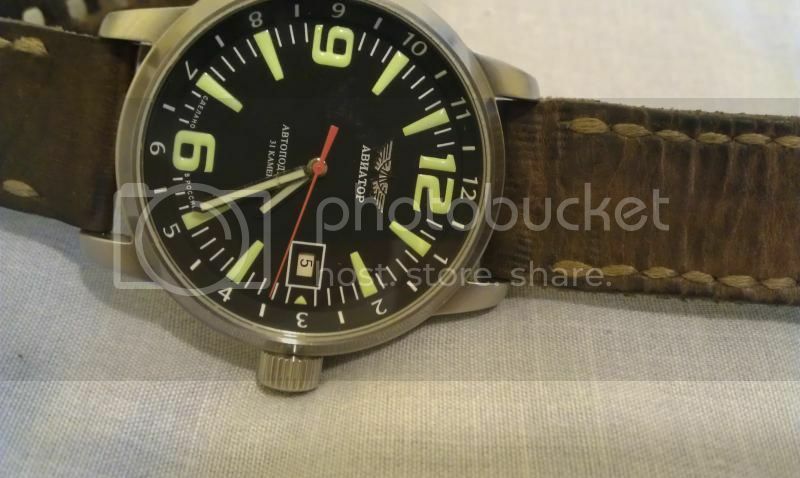 I'm looking for a no-date Vostok Amphibia dial "Made in USSR". Hi , looking for old silver sturmanskie dial (with wings on dial) for Poljot 3133.
hi im looking for 2416 watch movement a watch hands anyone know where to get? hour hands hole size 1.40mm and minute hands hole 0.90mm. need to a replacement to my 2416 aviator watch. EDIT: I managed to find a screw of the exact size and diameter which fits perfectly, retrieved from an old non working Timex Q-Quartz. Now my Ruhla is alive again, with a fresh battery! Last edited by vpn; August 31st, 2013 at 11:11. Last edited by ronnypudding; September 14th, 2013 at 04:22. Last edited by sq100; September 14th, 2013 at 11:07. My pie-pan Kirovskie needs a new and fully compatible crystal. The new replacement crystal is too low in profile so it often interferes with the movement of the second hand. Thank you.